CU center Jacob Epperson hit 9 of 10 shots at the Cayman Islands Classic last week after missing the season opener with an injury. OMAHA, Neb. 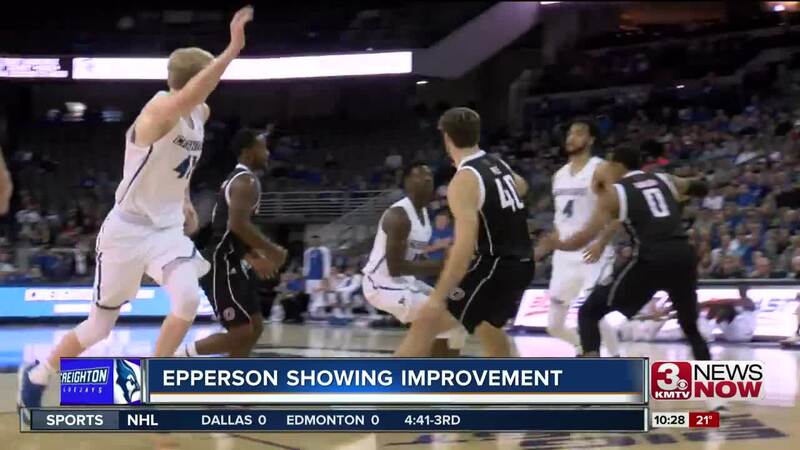 (KMTV) — When the Creighton men's basketball team takes on Montana Wednesday night, the Bluejays hope sophomore center Jacob Epperson can continue his improved play. After missing the season opener with an injury, the Australian native hit 9-of-10 shots over three games at the Cayman Islands Classic. "I think Jacob feels better," said Creighton head coach Greg McDermott. "I've noticed it in practice. He isn't limping around quite as much. I don't know if it was the ocean water, get an Aussie back in the ocean and everything. I don't know but he had a bounce in his step that he hasn't had consistently. I think he's feeling a little bit more confident." Wednesday night's game against Grizzlies tips off at 7:30 p.m. on FS1.